Group leader Johannes E.R.Hov was awarded Early Career Award by the Scientific Advisory Board of Oslo University Hospital. The official ceremony took place on Friday, May 5th 2016 at OUS, Rikshospitalet. All award winning articles were published in the second half of 2015. The awards are of NOK 50.000,- and are earmarked for further research activities. 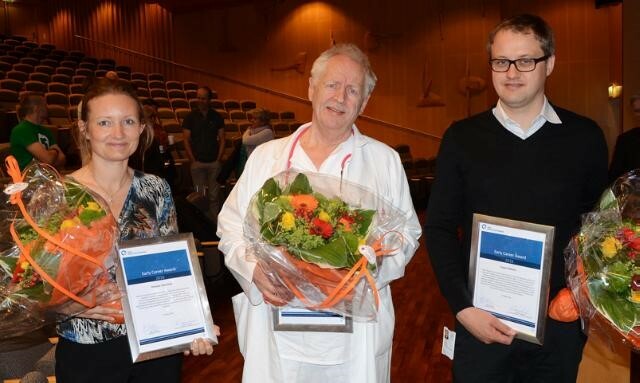 To make research a visible part of Oslo University Hospital (OUS)’s activities and to inspire all employees to publish their scientific findings OUS has established this tradition to award the authors of the best publications in every sixth month. Group leader Espen Melum was awarded Early Career Award by the Scientific Advisory Board of Oslo University Hospital. The official ceremony took place on Friday, May 27th at OUS, Rikshospitalet. A genetic analysis recently published in Nature Genetics (journal impact factor 29.35) sheds new light on the high comorbidity between primary sclerosing cholangitis (PSC) and inflammatory bowel disease. Researchers from four large disease consortia, encompassing hundreds of researchers from 26 countries, joined forces to combine data from studies of their respective diseases, amounting to 52,262 patients and 34,213 healthy controls. “This study is important because it creates a platform for understanding the molecular make-up of each disease, in the future enabling more specified treatment of chronic inflammatory disease”, says Tom Hemming Karlsen, coordinator of one of the participating consortia.